There are a number of opportunities for good gentles to be helpful at our upcoming Crown Tournament. Peruse the opportunities below and volunteer for your Kingdom! Duke Timothy needs help setting up the wooden lists the morning of Crown Tournament. He is bringing them to the event, but as he is fighting in Crown he would like to be able to focus on getting his mind set for the tourney. He can help set them up but it is not a one person job. If you can help, be on the list field between 8 and 8:30 am. Thank you! days, I am putting out a request for list runners for the day. I would optimally like eight but can do with as little as four. If you are interested please contact me off the list at kseib91@gmail.com. Thank you. beloved Kingdom fast approaches. Other may have many concerns about the upcoming Tournament; mine is having enough heralds. 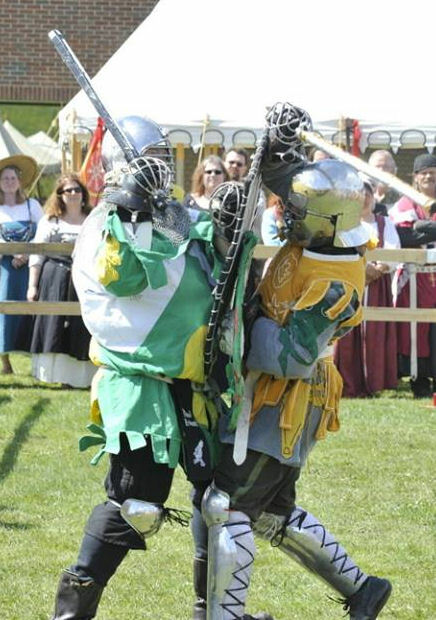 introduction of combatants and consorts, or just act as runner, please come and help. the populace into service as I journey to the site of the tournament. Hope to see, and hear, you all on the field.